As with other parks, it is best to visit Arusha National Park in the dry season, June to October. The wet months of November to May are the best time to visit Arusha National Park. Which of the Big 5 can I see in Arusha National Park? 3 of the Big 5. The park does not have any lion or Rhino. What is the weather like in Arusha National Park? Arusha National Park’s climate is normally pleasant and mild. 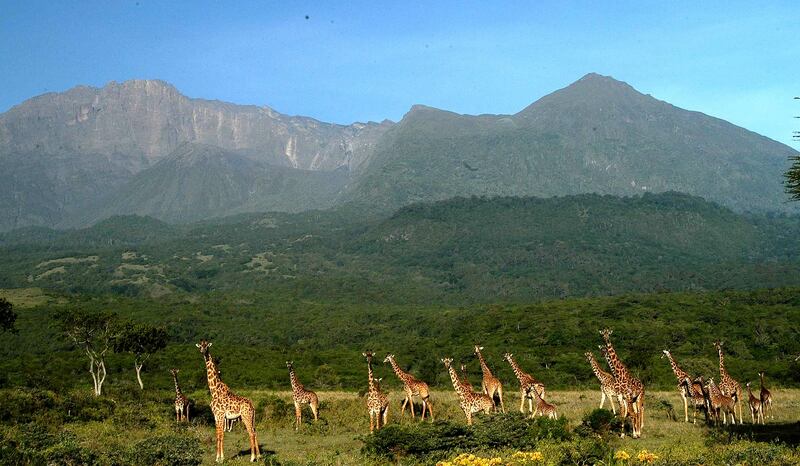 The altitude in Arusha National Park is varied, from 1,280m to 4,217m which causes in variations in climate within the park. Why should I visit Arusha National Park? The Arusha National Park, a small, (137 km²) but beautiful African park, is the closest park to the town of Arusha and Kilimanjaro, the gateways to the northern safari circuit. Not only is the wildlife in the Arusha National Park abundant, but it is also one of the most beautiful and topographically varied game reserves in Tanzania. The Arusha National Park’s three most significant features include: Tthe Rugged Mount Meru (Tanzania’s second highest peak at 4566m), the notably different colored Momela Lakes, and the 3km wide Ngurdoto Crater, which was formed about fifteen million years ago! The varied and beguiling animals and flora found in this game reserve are mainly determined by the different altitude and geography of these 3 “zones”. When is the Best time to visit Katavi National Park? The best time to visit Katavi National Park is in the dry season, June to October. It is however hot and dusty. The wetter months of November to April is the best time for birding. Which of the Big 5 can I see in Katavi National Park? 4 of the Big 5. The park does not have any Rhino. What is the weather like in Katavi National Park? Kitavi National Park has only two seasons. The Dry season that runs from June to October and the wet season from November to April. There is very little variation in temperature throughout the year and it is warm to hot and humid. Nights in Kitavi warm year-round. The warmest months are October to March, and the coolest are June to August. Temperatures during the day vary between 30 and 35°C and between 16 and 21° at night. Why should I visit Katavi National Park? It is wild, mostly untouched, has some very rare species of antelope. Katavi is a classic dry-country reserve. During the Wet season, when water is plentiful, the wildlife disperses into the woodland and wildlife viewing becomes a challenge. During this season it is humid and hot. After the rains, the Katuma River is reduced to a narrow stream, and the floodplains become a magnet for wildlife. The park centres on a series of wide floodplains, connected by a network of seasonal rivers – Ngolema, Katisunga, Katavi and Chada – which form the focus of Katavi’s wildlife viewing. During the dry season, Katavi’s floodplains are covered with grass. The green season sees these flood plains fill with water and look like a mini-Okavango after the rains. Katavi is very definitely less trodden and more remote but boasts elephant, leopard, giraffe, lion, zebra and the largest herds of Cape buffalo you may ever see, shadowed by lion, spotted hyena and leopard. Some of the notable species to be seen are the Sable, Roan antelope and Puku. In the dry season, when water is scarce, animals are drawn to the Katuma, Kavu and Kapapa Rivers. The wide Chada floodplain is a mecca for wildlife with watering elephant, countless crocodiles, and hippos by the hundred both in the river and grazing on the banks. When the waters retreat hippo crowd into the remaining pools, crocodiles retire to caves in the mud walls of the riverbank, and the rest of the wildlife, including buffalo and elephant are drawn to the rivers to drink. When is the Best time to visit Mahale Mountains National Park? The best time to visit Mahale Mountians National Park is from July to October when chimp trekking is easy. The weather is howvere good from May to October. Which of the Big 5 can I see in Mahale Mountains National Park? None of the Big 5. Mahale Mountains National Park harbours Tanzania’s densest population of primates: Chimpanzees, yellow baboon, red colobus, blue, red-tailed and vervet monkeys. What is the weather like in Mahale Mountains National Park? Why should I visit Mahale Mountains National Park? In short because of its beauty, lovely beaches and the Chimpanzees. Mahale is also probably the best place in the world for chimp safaris! In the extreme west of Tanzania is Mahale Mountains National Park. It has been described as “quite simply one of the most beautiful parks anywhere in Africa”. The lakeshore here is a beach of the finest powder-white sand, behind which rises a range of imposing mountains, covered with tropical vegetation. The Mahale Mountains National Park was originally created to protect the thousands of chimpanzees that inhabit the region. Covering about 1,600km² of the Mahale Mountains, this national park is home to around 1,000 chimpanzees. 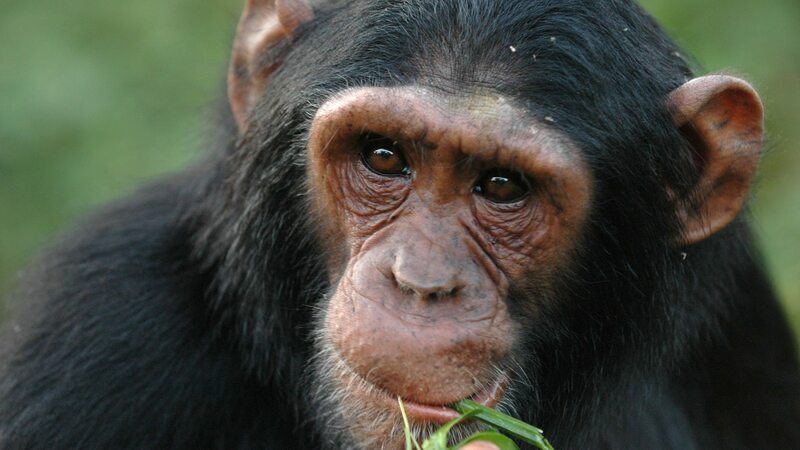 Most significantly, one group of 56 Mahale chimps – the Mimikire clan – has been habituated by researchers since 1965. They go where they want and when they want but are relaxed near people, so it’s possible to track and observe them from very close quarters. The hike to reach the Mahale chimpanzees can vary from a leisurely wander of 20 minutes to a more strenuous hike lasting up to three hours. Towards the end of the dry season (August to October) Mahale’s chimp safaris are at their easiest, as the forest paths are at their driest and least slippery, and the chimps are usually at their closest to the shore. Mahale Mountains National Park is renowned for its fantastic sunsets over Lake Tanganyika, which makes it an essential stop for keen photographers and safari enthusiasts. The park’s breathtaking array of habitats include rainforest, grasslands, alpine bamboo and woodlands; where some 50 species of animals have been recorded, predominant among these being representatives from various monkey and ape families, and over 90 unique species of fish swim in the clear waters of the lake. The best time to visit Mikumi National Park is in the dry season, June to October. It is however hot and dusty. The wetter months of November to April are the best time for birding. Which of the Big 5 can I see in Mikumi National Park? What is the weather like in Mikumi National Park? Mikumi has only two seasons. The Dry season that runs from June to October and the wet season from November to April. There is very little variation in temperature throughout the year and it is warm to hot and humid. Nights in Mikumi warm year-round. The warmest months are October to March, and the coolest are June to August. Temperatures during the day vary between 26 and 30°C and between 17 and 22° at night. Mikumi National Park lies just to the North of the famous Selous Game Reserve and covers an area of 3230 km². It is surrounded by Uluguru Mountains to the northeast, the Rubeho Mountains to the northwest and the Lumango Mountains to the southeast. The fourth largest park in Tanzania, it has not become a focus of mass tourism. The park is part of the Selous ecosystem, and not far from Ruaha. There are some points of comparison to the northern parks of Tanzania which include the vast floodplain grassland, shrubland and forest areas, populated by herds of ponderous elephants, wildebeest, buffalos, zebras, elands and impala, with their attendant predators, from lions, leopards, hyenas to the rarer wild dogs. Wild Dogs, threatened elsewhere in East Africa, few of them thrive on the Mkata flood plains despite the Tanzam Highway which transects the park. As in the Selous, there is as diverse range of habitats which are home to a great number of rare or endangered species, but here, you can track them better, since Mikumi is more easily accessible and crossed by many trails. In the dry, from June to October, the plains teem with antelope and you may spot tree-climbing lions that have learned to get a higher vantage point as a hunting strategy, and also to keep away from tsetse flies. The elephants are smaller than those in other parks. A possible subspecies of giraffe seldom seen on safari in Tanzania’s northern parks is also found here, distinguished from the Maasai and reticulated giraffes by its unusual markings. Rare and endangered species, including the Sable and Roan antelope, Lichtenstein’s hartebeest, and the greater kudu, are all to be found on an outback safari. In the wet season, driving is difficult on the slippery black cotton soil of the plain, but in the north of the park, hippo pools are fringed with hundreds of wading birds. The best time to visit Saadani National Park is after the rains, in January and February, and from June to August, when there is still plenty of water on the plains and wildlife stays within the park. The best time to visit Saadani for whale watching is during October and November. As a general bush/beach break destination Sadaani is good to visit most of the year. Which of the Big 5 can I see in Saadani National Park? 4 of the Big 5. The park does not have Rhino and lion and leopard are rare. This is a beach and bush destination. You can combine your land safari with a beach holiday and perhaps see the Green turtles, Humpback whales and dolphins. What is the weather like in Saadani National Park? Why should I visit Saadani National Park? Saadani National Park, 1100 km² in size and is situated between Dar es Salaam and Tanga, located in the centre of historic triangle of Bagamoyo, Pangani and Zanzibar. It is also the only wildlife sanctuary in Tanzania bordering the sea. It is home to approximately 30 species of large mammals, numerous reptiles and birds and of course has the added dimension of the ocean where you may see fish, Green turtles, Humpback whales and dolphins. The Saadani National Park is home to a variable mix of both marine and mainland flora and fauna. The vegetation in the park is quite unique and includes mangrove forests growing along the shores of the Wami River and into ocean, savannah, harsh black cotton plains and the vibrant coral reef in the warm Indian Ocean. Although the park has been hit hard by poachers in the past, some of the more common animals are making a good comeback. Saadani has a thriving population of waterbuck, wildebeest, Lichtenstein Hartebeest, reedbuck, buffalo, and giraffe. Warthogs, baboons, and colobus monkeys are often spotted, while the elephants, lions, and leopards are quite shy. For birdwatchers, this place is truly spectacular. A boat safari on the Wami River is a true highlight for any visitor where you will see pods of hippos, huge crocodiles, malachite, pied and giant kingfishers. What can I do in Saadani National Park? Activities in Sadaani National Park include game drives, boat safaris and walking safaris accompanied by an armed ranger. Historical tours to the old Saadani fishing village to see the remains of buildings that existed when this place was a bustling port trading ivory and slaves, can be organized. Cultural tours to the main ethnic tribes in the area (Waswahili, Wazigua, and Wadoe) are on offer. Saadani National Park is a place for adventurous and luxury travelers as well as families. Where else can you see elephant against the back-drop of the Indian Ocean? When is the Best time to visit Tarangire National Park? The best time to visit Tarangire National Park is during the dry season, June to October. This is the time of year when the animals congregate around the Tarangire River. Tarangire has one of the highest concentrations of Elephant. In the dry months, they wonder down to the swamp as the day gets warmer and cool off it its waters and later in the afternoon, they move up to higher ground. What is the weather like in Tarangire National Park? Why should I visit Tarangire National Park? For the elephants, of course. The Tarangire National Park, only 130km (80 miles) from Arusha and 8km (5 miles) off the Great Cape to Cairo road, is easily accessible but often overlooked in favor of the other northern circuit parks. However, a game drive here rewards with the unusual scenery of giant silver-trunked baobab trees, and the Tarangire River is a favorite haunt for wildebeests, zebras, elands, and elephants. We include Tarangire NP on our Northern Tanzania itineraries and it is one of our favourite parks in East Africa. Many people either miss out Tarangire altogether or they only venture into the park for a quick morning or afternoon game drive into the northern areas. A longer stay in Tarangire means that the southern reaches can be explored away from the crowds where it offers a much quieter safari experience than other parks in northern Tanzania. Tarangire is a generally considered a seasonal reserve and the long dry season (June – October) is the best time to visit. During the short rains of November and the long rains of April-May the game mostly disperses into the Maasai Steppe; however, as the landscape dries the wildlife returns, drawn back by the Tarangire River. During these dry months the park offers spectacular wildlife viewing opportunities. You’ll see all the big African game, including large herds of elephant (sometimes up to three hundred strong) that congregate along the riverbanks. The concentration of game is exceptional. Large populations of wildebeest, zebra, buffalo, giraffe, eland, impala and warthog all go in search of water. Lions and spotted hyenas follow accordingly. Lions and leopards can be found throughout Tarangire, however cheetahs are mostly found in the open areas of the south. Wild dogs sometimes pass through the park, although sightings of them are rare. Tarangire National Park is also famed for its ancient baobab trees, as well as its prolific birdlife. Yellow-billed and saddle-billed storks are often found in the Tarangire River, and orange-bellied parrots and red-and-yellow barbets are spotted in the acacia woodland. Over 500 species have been recorded in the park, including ashy starlings and large flocks of yellow-collared lovebirds, both of which are endemic species to Tanzania. If you’re visiting the park between November-May you likely won’t see such high concentrations of game, but we can still recommend visiting, especially if you want to avoid the crowds or if you have a particular interest in birdlife. We mainly use two fantastic properties within the park. For our ‘boutique’ option our clients stay at the Tarangire River Camp, and for clients who have selected our ‘luxury’ option we use Tarangire Treetops which is regarded as one of Tanzania’s most beautiful and unique properties. With both the ‘boutique’ and ‘luxury’ option our client’s will have a private 4×4 vehicle for safari game drives and a local English speaking guide. Other accommodations are also available to be booked and our specialists will match you to the most suitable accommodation for your requirements and sense of style. 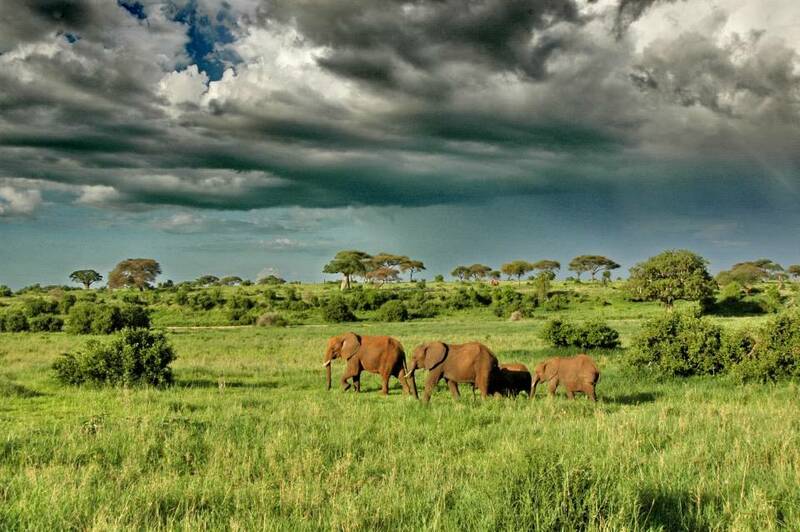 Elephant, lush green scenery and thunder clouds are common place in the Tarangire.